The Government Accounting Standards Board establishes accounting rules used by state and local governments. In this article, Greg LeRoy of Good Jobs First discusses state and local disclosures under the Board's new accounting rule. Greg LeRoy is executive director for Good Jobs First, a national policy resource center in Washington, D.C.
As of early June, more than a dozen local governments have issued Comprehensive Annual Financial Reports (CAFRs) reporting for the first time how much revenue they lost to economic development tax break programs. Some of these early disclosures are overly narrow, others are needlessly difficult to decipher—and a few go far beyond the basic requirements, providing taxpayers and investors outstanding new information. The new reporting is pursuant to GASB Statement No. 77 on Tax Abatement Disclosures (see Weekly State Tax Report, January 27, 2017: “2017: A Landmark Year for Transparency on State and Local ‘Corporate Welfare’”). This is the first time GASB has ever set forth a Statement on any kind of tax expenditure. The 2014 Exposure Draft for what became Statement 77 in 2015 drew almost 300 comments, making it one of GASB's most heavily-debated proposals ever. Emblematic of the two extremes seen so far under Statement 77 are two big cities, each confounding our expectations. Columbus is Ohio's biggest city and capital of the state that was by years the first to disclose company-specific tax abatement records online— in 1999! Columbus is also home to State Auditor David Yost, who fought publicly several years ago with fellow Republican Gov. John Kasich over his office's right to audit Kasich's privatized JobsOhio agency. Yet when it came to complying with GASB 77, Columbus City Auditor Hugh Dorrian (D) offered a degraded Note that failed to capture the city’s three largest economic development tax abatements. However, Dorrian (an iconic figure in Ohio auditing circles who is soon to retire at age 81 after winning election 12 times) did insert a second passage in the CAFR, also labeled “Tax Abatements.” It references Statement 77, directs readers to the degraded Note, and then proceeds to disclose three abatement program payments totaling $14.6 million (mostly rebates of municipal personal income taxes to downtown employers). Birmingham is Alabama's largest city and that state has been both exceedingly generous and quite opaque in its economic development spending, only recently issuing its first state tax expenditure report, for example. It has also been far behind other states in failing to disclose company-specific incentive records (ranking 44th in Good Jobs First's most recent “report card” study on transparency). Yet in its FY 2016 CAFR issued in November 2016, for which it was not yet subject to Statement 77, the “Pittsburgh of the South” published an astoundingly complete set of data. Taking up six pages, Birmingham's Note does not just state the aggregate cost of each abatement program. It also names every corporate recipient of more than $1 million, details the cost of each such deal, and even includes the projected future-year costs of each agreement. None of these additional records is required by GASB 77, and the future-year liabilities are not even mentioned by GASB as an optional possibility (although some commenters argued that if public employee pension and health care future liabilities are to be disclosed, so should future abatement charges). New Mexico State Auditor Tim Keller (D) has ambitious plans for putting GASB 77 on steroids. He has considerable statutory authority and is using it aggressively. (His zeal may reflect the fact that as a state senator, his two incentive disclosure bills passed the legislature unanimously only to be vetoed by Gov. Bill Richardson (D) and Gov. Susanna Martinez (R)). Keller has issued electronic reporting templates to every locality and state body, instructing them to provide the names of every abatement recipient, as well as the cost of every deal. His office will then collect all of the spreadsheets, combine them, and publish all of the data online in a downloadable form. No other state official has moved to make GASB 77 data so unified, comprehensive and accessible. Keller's office is also ensuring that governments faithfully report the inter-governmental revenue harms caused by abatements. 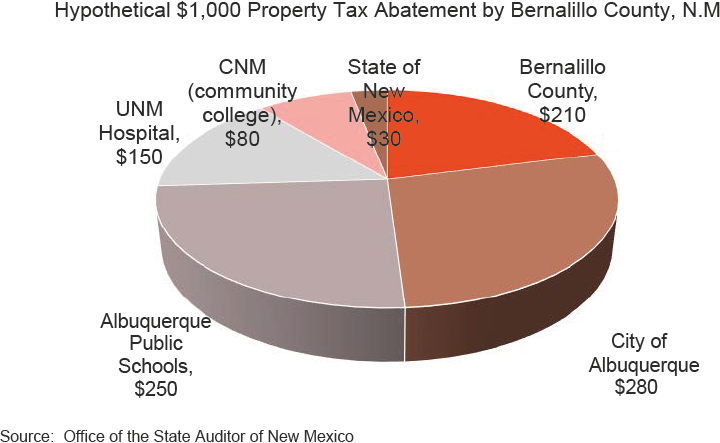 For example, a $1,000 property tax abatement by Bernalillo County (which includes and surrounds Albuquerque) will trigger GASB 77 reporting obligations by six governments (see chart). Close observers of the Statement 77 process have long predicted that one very large kind of tax abatement—tax increment financing, or “TIF”—would become embroiled in controversy. That prediction proved accurate and GASB finally moved to rectify the matter in late April. The nub problem is that TIF—and some other kinds of abatements—involve tax diversions or tax rebates rather than tax exemptions or tax reductions. By every other measure, they meet GASB's definition of an abatement: they occur pursuant to an agreement between a government and a taxpayer; government agrees to receive less revenue; and the taxpayer agrees to perform a quid pro quo (e.g., hiring or capital investment). TIF effectively works three ways when a new development results in higher property values and therefore higher property-value assessments and taxes owed. Either the increase—the so-called “tax increment”—is applied to debt service on bonds that directly benefit the development; or the increment is simply rebated; or it is refunded to the company on a “pay as you go” reimbursement basis as the company builds public or private structures as agreed per the terms of the deal. But some public officials disagreed, and even the American Institute of Certified Public Accountants challenged TIF's inclusion in a formal comment to GASB. Essentially, it argued that since taxpayers remit the increment, the tax isn't abated (even if it is soon returned). In the same vein, when Ohio State Auditor Yost advised Columbus and other Ohio localities, his initial written advice indicated TIF likely wouldn't be covered. Unfortunately, the Implementation Guide only applies to CAFRs whose budget years start July 1, 2017 and beyond. So it does not apply to any of the first year's records. Hence it will sometimes be difficult or even impossible to compare the first and second year of data in some jurisdictions. As noted above, GASB has maintained that debt-based TIFs are not subject to Statement 77 because the debt service paid for by these tax diversions can be found in existing CAFR passages covering municipal debts. But one early disclosure suggests that this may result in undisclosed revenue losses. Denver lost $96 million in revenue to TIF in 2015, but this information was not found in its recently-issued CAFR. Instead, that figure appears in the CAFR of the Denver Urban Renewal Authority (DURA), a separate governmental body jointly controlled by the City and County of Denver. If under Statement 77, DURA is to be treated as the actively abating government (because it technically creates and manages the TIF districts), then the revenue loss suffered passively by the City of Denver should have appeared in its Statement 77 Note (as in the New Mexico examples cited above). However, it does not, so taxpayers seeking to determine the impact of TIF on Denver's tax base would have to read the DURA CAFR and then impute the city's loss, as we do here. The use of redevelopment agencies or other special authorities to administer TIF is not unusual, so this Denver-DURA disclosure problem may foreshadow more Statement 77 compliance problems. Based on our experience with past Statements, we expect that the first year of Statement 77 data will be uneven. GASB's Implementation Guide clarification should improve TIF and other disclosures. Private accounting firms will hopefully propagate best practices among their clients; indeed, by mid-2018, we expect to be able to discern which accounting firms are taking Statement 77 seriously and which are not. They and governments will likely copy each other and develop more standardized reporting formats. Hopefully, some state officials will follow New Mexico's lead to make the data downloadable. And to promote the use and analysis of the new data, Good Jobs First will soon unveil Subsidy Tracker 2, designed to compile Statement 77 data nationally. However, to the extent any public officials intentionally resist Statement 77, we are reminded of some localities' condescending and exclusionary histories against public participation. Gone are the days of economic development dockets “announced” only in six-point type in the Legal Notices of the Saturday newspaper. Gone are “public hearings” held with no public in attendance, no advance release of the hearings' content, and active government resistance to the disclosure of project details. Gone now too, thanks to Statement 77, are financial reports that fail to clearly report the costs: how much revenue is lost to tax-break programs. Politicians have and always will tout their benefits; now the debate is gaining sorely-needed balance. The original version of this insight indicated that Ohio State Auditor David Yost's office played a role in the writing of the Columbus Comprehensive Annual Financial Report (CAFR) pursuant to GASB Statement No. 77 on Tax Abatement Disclosures. The Auditor of State’s office did not direct or participate in the writing of the City of Columbus’ 2016 CAFR in any way, including with regard to Tax Abatements (p. 35), Tax Increment Financing Districts (TIF’s) (p. 94) and Note M – Tax Abatements (pp113, 114, 115).